Named after the Norse goddess of youth, IDUN Minerals takes inspiration from the simplicity of Nordic nature, but its ambitions reach further afield. Originally available only in Swedish pharmacies, the brand now offers pure cosmetic and skincare products, suitable for all skin types, across the globe. nickel, chrome, perfume, parabens, silicon, talc, oils, bismuth oxychloride and microplastics. The company’s mission is, quite simply, to offer the purest products possible, suitable even for those with the most sensitive skin. It looks to be a winning formula. 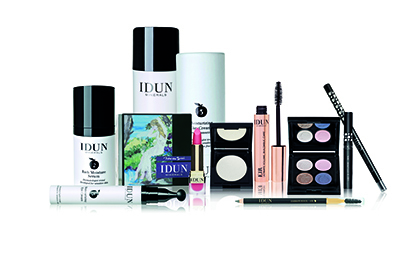 From a pharmacy-only brand, IDUN Minerals has gone on to become an international name, with significant interest not only in other Nordic countries but also in Asia, the Middle East and the USA. The company also has an online shop and there, too, international sales are strong. And as the brand has grown in market share, so its product range has increased, from a starting base of 20 to almost 200 today. to meet that demand,” says Thunstedt. certain ingredients may affect the environment or human health. “Consumer awareness has definitely increased. products, therefore, she says that the company takes its lead not from the cosmetics industry, but from its customers.